Just be clear on what they're giving you. Whatever it is, it'll likely entail a two-year commitment to them. I have the satellite dish on the roof. There are 4 coaxial feeds from roof to each set top box. I have more than 4 tv's and all are home run coax from basement to each room plus each run is a quard so 2 coax plus cat 5 and phone. I want to add coax to the hd dvr so we can record 1 watch another station then also network the settop boxes of course after i connect to dish. Right now I have 2 connected via cat 5 and quality is good. Ok there are 4 connections from the satellite dish which i assume are home run to each set top box. 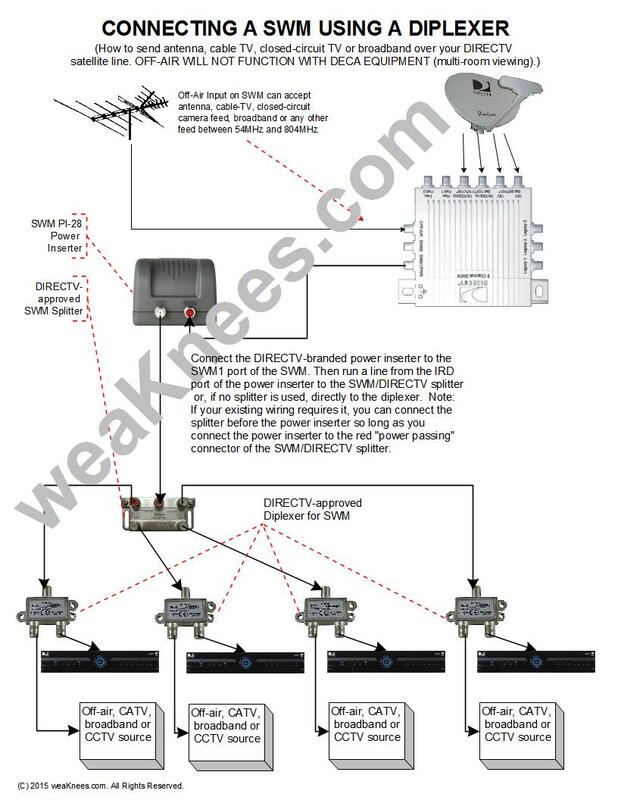 This is where i get lost because the descriptions for the swm indicate 18 and 13 volts so where do i connect the coax cables that go to the set top box. The four wires from the dish go to the SWM. Then, from SWM1, a wire can go inside the house and split into up to 8 legs to go to each receiver. Please see the wiring diagrams referenced above. Michael: I have two pretty new DirecTV receivers with a Slimline 5S dish. One receiver has a DVR and the SWM box, the other has a problem. All was working fine until we had a power outage a few weeks ago, after which there was a satellite signal not found message. When I try to Repeat satellite setup, I get SWM not detected. I unplugged the SWM box which is attached to the other receiver until the light went off, then replugged, with no results. The interesting thing is that in fooling around with the receiver a few weeks ago (and every time since when the power goes off briefly), I was able to get the TV working by going into the Repeat satellite setup section. Instead of being grayed out, as it is now, the Switch type field let me switch from "SWM" (which was highlighted) to "Multiswitch". When I did so, and proceeded with the setup, I got a message something like No satellite signal or no SWM detected - I don't remember what exactly - but then it started downloading the guide and completed it and then the TV worked fine! In trying to avoid having to go through that nonsense every time we have a power outage (which is common here), I clicked on Restore settings in the Satellite setup menu, after which I no longer have the "Multiswitch" option, and the unit remains dead. I have a DirecTV technician coming out in a couple of days, but I'd be interested in knowing whether you'd heard of anything like this or have any further suggestions. Since I was able to get the TV working perfectly after going through my weird little fix, I believe that the cabling is okay, and probably the ?splitter at the dish area. Power outages can do all sorts of strange things. If you have a DIRECTV tech coming out, he/she should be able to isolate the problem.